While catalog pictures can be deceiving as they are sometimes computerized drawings, the new Lionel catalog shows what looks like actual photographs of the J3A Hudsons, and the gap between engine and tender is fairly large. I understand it has to be a certain distance to accommodate minimum diameter curves - O54 in the Hudson's case (otherwise front of tender collides with rear of locomotive cab). However Lionel has a technology called "kinematic drawbar" that works quite well - my Legacy S3 locomotive has it and it seems fairly strait-forward Since whistle steam is now almost standard feature on scale Legacy steamers, is it too much of a stretch to install kinematic drawbar on new releases as well? Or, include an extra drawbar that allows close coupling, am not sure if that's feasible given wireless technology though. Maybe others are not as bothered as the gap as I am, and frankly, I am not a bona-fide rivet counter. For some reason the gap is a sore spot with me, perhaps because when I see photographs and videos of steam locomotives, they don't have a large gap (nor do they run on 3-rails but that's another matter I've even replaced the stock drawbars on my PS3.0 engines with the shortest one possible. Don't ask... you'll get yelled at. I hear you Paul. The gap bugs me also. The gap is not so noticeable on my ESE Hudson, Sadly Lionel didn't include a skid plate between the engine and tender. Wish Lionel would step up their game and have chains on the tender trucks, and include shorter drawbars for us with larger curves if the engine doesn't have kinematic drawbar. You can fabricate a shorter drawbar, I use fiberglass sheet or brass sheet. It's strong enough and easier to cut to shape than steel. The drawbars can be shortened without too much difficulty. The simplest way is to cut them, remove the blackening on the ends, overlap the cut ends to the new length you desire and solder them together. Recall reading they were not interested in modifying any of the tooling. If the locomotive didn't have whistle steam it wasn't going to be added, etc. Close coupling would be nice. At least no thumbtack! The catalog clearly states that the new J3a's will have whistle steam. I also think they probably used the TMCC J3a for the catalog photos so the newer, shorter wireless tether should be used on the new model. I think Lionel has heard 16 years of complaining about the tender gap, including myself, and will put an end to it with these new models. See what comes, that's for sure. Lionel did close the gap from the TMCC m1a( and Legacy M1b), when it offered the Legacy M1a, by shortening both drawbars. The optical devices are smaller in all dimensions which take up less space on the drawbars. The Vision Niagara couples closer than the CC version too. With all the endless posts on this topic its a wonder there's not a ready met 3rd party solution of short draw bars for all makes and sizes. Is it more than just a plug and play swap? Some of these engines look pretty complicated to get apart. I wonder what an O54 curve would look like in real life. Maybe like a 216 foot diameter circle. Bet you have to slow down before making those curves. 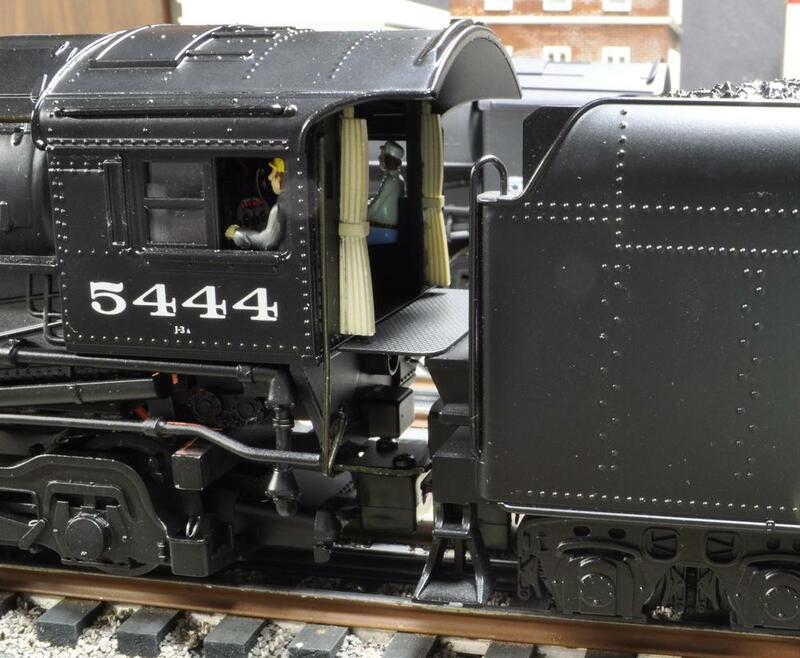 The O-54 diameter criterion could prohibit Lionel from using a shorter drawbar, but am not certain. The kinematic drawbar would work well - assuming I understand its design. From swapping drawbars on Premier steamers I know that just 5 mm makes a huge difference in how tight an engine can safely make a turn without tender and cab hitting together. Unfortunately, I don't posses the skills to cut and re-weld the existing drawbars. Well, here's something to consider. The catalog they call art or artists rendition, which means it isn't the real deal(yet). I went back and looked at the catalog for the S3, Berks and Niagara. What I found interesting is none mention drop plate but I do know that the Niagara and I think the S3 have for sure. So, the Hudson's may have those as well as a short drawbar. The artwork does not show the infrared sensors either and looks like folded paper drawbar almost not mating up. We'll really have to wait when they(Lionel's Ryan and Dave) show off a preproduction model if they happen to. I can appreciate folks do not want to take a hacksaw to their fresh purchase. Here's an article on real world railroad curves. If I can do my math right and maybe I didn't, I get O-205 would match the minimum in north american for general service. Hence they can close that gap. This is true. I have both the Legacy M1A and the Legacy M1A. If you notice though, it was not a matter of simply shortening the drawbar. The whole coupling linkage is different on the M1A. It smartly attaches further back into the locomotive, allowing for a long drawbar and it associated longer arc which allows the rear of the locomotive to jut out on curves without as much of a gap, whereas the M1B drawbar is anchored near the back of the locomotive and necessitates a large gap in order to allow enough room (especially on S curves). IMO the M1A linkage is a really simple elegant design principle that should be considered on all the locomotives where feasible. If you look at the photos above, on the top one (M1B) the drawbar is anchored just below the cab, whereas on the bottom picture (M1A) the drawbar goes through to the truck and is essentially anchored where the rear truck wheels are. So try to visualize how the rear of the cab behaves in curves with the two arrangements. Yes, true. Also, the slightest change in grade on a curve can make all the difference as well. If the front of the locomotive is slightly raised going through the curve, the back of the cab dips down and could hit the tender (whereas that might not happen if completely level throughout the curve). And S curves really complicate the issue as well, which basically cause a kind of diagonal-drawbar situation that is the first place to require the longest drawbar on the layout. Avoid S curves (e.g., back to back 072, etc). Even a bit of a straight between them is much better! I dont reckon a real J3a or M1a would negotiate that tight of a turn : ) Seeing the J3a would be about 112 feet long including tender. When drawbars were just little pieces of steel or brass with a hole or such at each end, and tethers were wires and plugs not married to, or even dating, the drawbar, all you had to do to get better-looking gapage was to drill another hole or two, or make a new drawbar from steel/brass stock (easily available) with hand tools, swap them out, and, badda-bing, badda-boom: all was improved. 15 minutes, in most cases. I really dislike "wireless" and circuit-board tethers. Really. It makes the ugly gap permanent (for most), or a pain to correct (for some) - and gives us something else needlessly complex to break. The world just keeps getting more and more inconvenient and less malleable. These over-wrought tethers are not good ideas. Yup. When some folks mention drilling holes or fabricating new drawbars, I don't know how that's done with engines and tenders that are equipped with wireless tethers. Without extremely complicated surgery, practically speaking, it does not seem possible to shorten the gaps between engine and tender. If there is a reasonably easy solution to this, I'd sure be interested to hear about it. I'll make sure the final design has them closely coupled. Would it be difficult to offer a change out option in the packaging? Short (that is close) for those that can run it, and long for those that need it? As posted above, cut, overlap, solder together. The "hard" part is not the shortening process but removing it from the engine and/or tender. The wires from the photo diode have to removed from their connector and threaded through the frame after removing the trucks. Well there you go. Ask and you shall receive. I am putting my order in for one this week.